The name of Joseph Littlemore was completely unknown in clockmaking until recently, when the lantern clock pictured here came to light. It emerged from a house in Manchester, where its external frame had clearly been kept polished, but the movement had probably not been cleaned for two centuries - that much dirt and corrosion cannot crop up in a mere century. To a collector, the lack of cleaning is a delight. It means not only that the clock has not been overcleaned or 'got at' in recent times, but also that it will not be nearly so worn as one of similar age, which had been running until more recently. It was obvious that the clock was of serious age, dating from perhaps the 1690s. But the maker was completely unrecorded. There was a record of a couple of longcase clocks, one of them of month duration, signed without a first name as just 'Littlemore Frodsham' and dating perhaps from the 1720s. There was also a Jacob Littlemore, who was listed as working at Ruabon about 1725 to 1728, and then at Wrexham in Wales, where he died in 1745. Whether Jacob was the same person as the Frodsham maker was unknown. A bit of research soon found that when he died in 1745 at 'Bersham in the parish of Wrexham in the county of Denbigh and Diocese of Saint Asaph', as Jacob Littlemore, 'gentleman', an administration was granted to his widow, Mary, which stated that she was 'a Dissenter from the Church of England, commonly called a Quaker'. So we had a start with Jacob, but the question was, was he the same man as previously at Frodsham and was he connected to Joseph? At first I wondered if Joseph and Jacob might have been brothers. The signature of clocks as 'Littlemore' with no first name often implies a joint family product, such as between father and son, or two brothers. Oddly enough I did trace two brothers of this name who appeared to have moved to Frodsham from Warrington at the right period and who seemed to be the likely candidates. Fortunately, before I got too far down the track in following what proved to be a false start, I stumbled into a present-day member of the Littlemore family, who told me I must get in touch with Philip J. Littlemore, which I did. Philip is the principle researcher into that group of families and has an absolute mountain of information. I was told he had spent years compiling Littlemore data and what he doesn't know about them is not worth knowing. This proved correct and it turned out that he had many facts about Joseph and Jacob. He soon put me right and I am grateful to him for allowing me to use some of the biographical details here, many of which came from his voluminous files. Joseph Littlemore was born about 1651 at Frodsham, the son of William Littlemore, a yeoman, and his wife Elizabeth. The parish records are patchy at this time, so no baptismal entry has been found for Joseph. The couple had at least four children who survived. Sadly the mother died in 1661, when Joseph was only about ten years old, and the father, William, died in 1663, when Joseph was about twelve. William left a will specifying that Joseph was to be brought up till he was fourteen by his elder brother, another William, who succeeded his father as a yeoman farmer at Frodsham. This was the usual age of apprenticeship and it is assumed that young Joseph was put out to learn a trade about 1665 - perhaps that of a whitesmith or gunsmith. Very few apprenticeship records survive from that time and it is not known who his master was. By 1681, at the age of about thirty, we know he was already a committed Quaker and was living at Kingley, a township just to the south of Frodsham itself and still within Frodsham parish. Joseph Littlemore, 'gun maker', of Kingsley was married on 12th April 1687 at the Quaker meeting house at Newton, also in Frodsham parish, to Hannah Williamson, the daughter of John Williamson, a staunch Quaker and tenant of nearby Crewood Hall. Joseph and Hannah had ten or more children, the eldest surviving one being Jacob, born at Kingsley 19th September 1689. A document of 1699 describes Joseph as a smith of Frodsham. He became overseer of the poor at Kingsley in 1690 and at Frodsham in 1696, implying that they moved to Frodsham between those dates. When Joseph's elder brother, William the yeoman, the one who had brought him up between the ages of twelve and fourteen, died in 1694, he referred to him in his will as 'Joseph Littlemore of Frodsham, whitesmith'. Further documents of 1696 and 1698 refer to him as a 'smith' and a churchwarden's account for 1707 records payment to him for supplying nails. By 1712 Joseph and Hannah had moved to Preston on the Hill, about three miles east of Frodsham but within the parish of Runcorn. Joseph Littlemore died at Preston on the 23rd April 1721 aged about seventy and was buried at Newton Burial ground three days later. His widow, then moved to live in Frodsham, perhaps with son Jacob, where she died three years later and was buried on 21st January 1724, also at Newton Burial Ground. The only object he made which survives today after fifty years of hard work is the clock illustrated here. Joseph's trade was variously described as that of a smith, whitesmith, gun maker. A smith of course was a blacksmith, who usually made heavier goods, sold in what was then termed 'in the black', which meant japanned or painted black; a whitesmith is a term which is today extinct but meant a blacksmith who worked in smaller goods in polished metal, sold 'in the white'; a gunmaker or gunsmith is self explanatory. But the point is that these were the trades, from which most rural provincial clockmakers originated. They were eventually termed 'clocksmiths'. Most rural clockmaking families began with all kinds of smithing work, and diversified gradually into clocks, often over more than one generation as the demand gradually appeared. Usually they were located on main coaching or 'post' roads to catch the passing horse and carriage trade as well as local trade; better still at a cross roads, with four chances of passing traffic. Many made guns, and all could repair guns. 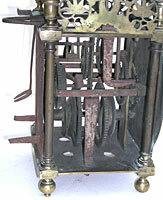 A number of clocksmiths are recorded, whose known output in clocks is very small, sometimes even only a solitary example. 1. This lantern clock with original anchor escapement is signed 'Jos. Littlemore Fecit'. Integral pillars. Front left foot replaced. Date 1690s. Clocksmiths could not possibly build up a thriving clock trade amongst locals in a catchment zone of such a small population, and those who diversified more into clocks would take their product to local towns to sell in the markets there, even though this was usually contrary to local by-laws. Quakers were noted for not being daunted by long journeys if need be. An extreme example was John Sanderson of Wigton, Cumberland, who at the beginning of the eighteenth century took his clocks as far away as Edinburgh to sell - where he was prosecuted for it! Turning next to Jacob Littlemore, he was born on 19th September 1689, the son of Joseph and Hannah. In 1713, then termed a 'clockmaker', he married at Newton to Mary James, daughter of another staunch Quaker, John James of Wrexham. It may be through this marriage that Jacob eventually came to live at Wrexham, as John James left bequests to his daughter when he died in 1736 aged ninety three! Jacob seems to have been more of a merchant and entrepreneur than a regular clockmaker. His business dealings seem to have been very shaky at times. Quakers took care of their own and might assist any 'Friend' in trouble where they could, principally to keep their good name. This was vital in their business dealings for Quakers were proud of their reputation for honest dealing with a public who might otherwise have been hostile to their nonconformity. It became well now that if you dealt with a Quaker you got a good deal. In 1724 they came down on a fellow Quaker, Allan Jobson, for having sued Jacob ' at law without due procedure amongst Friends and thereby broke the rules of society', and Jobson was 'willing in humility to acknowledge his error'. Jobson should have sought redress from within their society before turning to the law. In 1726 Jacob, still living in Frodsham, entered into a partnership to lease a quay on the Frodsham side of the river Weaver, clearly for the revenue he might gain from ships unloading there. In 1727 there were more disputes between Jacob and other Quakers, clearly about unpaid debts, and on one occasion he was accosted by an aggrieved Friend, who must have been sorely aggravated to have broken his vows of peace. More than once the Quaker elders tried to give Jacob time to sort out his finances, but in 1728 he was officially declared bankrupt, listed then as a 'clockmaker and potter'. He never seems to have made pots but was probably involved in handling them as a merchant. In 1729 he was obliged to draw up accounts of his dealings for consideration by his fellow Quakers. Papers survive from this accounting showing that in 1730 he had raised £1,848 from the sale of various properties, yet his debts had amounted to £400 above and beyond that! It is perhaps fortunate for Joseph that his earlier death had saved him from witnessing that shame. Amongst those he was in debt to were his father-in-law, John James (over £86.00), and his cousin, clockmaker John Seddon (over £43, plus part of another joint debt) and his sister, Esther. Seddon was a clockmaker and no doubt had supplied him with clock parts. The list of creditors included others who had the same surnames as known clockmakers, and it is possible they were connected in the trade. He was then still living at Frodsham and moved to Bersham near Wrexham after 1736, perhaps after his wife inherited property there from her recently-deceased father. Despite his chequered financial dealings he was described as a 'gentleman' in when he died at Bersham in 1745. Perhaps he was far enough away from Frodsham to have escaped the memory of the trouble he had there. Mary Littlemore, Jacob's widow, left a will, when she died at Wrexham in 1752. No mention of clocks is made in any of the wills or other documents. No clock appears to be known today by Jacob. In 1718 Jacob Littlemore had taken an apprentice clockmaker named William Whittaker for seven years for a fee of £16.00. William was also a Quaker - Quakers usually took as apprentices those of their own faith. William Whittaker was married in 1725 at Newton to Jacob's sister, Esther, and then seems to have moved to Chester, where he fell into evil ways. In 1727 he was found 'guilty of making a horserace and some disorderly practices' and it was later stated by other Friends that 'William Whittaker dishonours his profession'. In 1728 they were informed that he had been imprisoned for debt. He was last heard of in 1730, believed to have been then at Northwich, and he probably died not long after. When Esther appeared on the list of Jacob's creditors in 1730 she was described as a widow. It seems some of Jacob's impecunious habits rubbed off during William's training as an apprentice. No clock seems to be known today in William Whittaker's name. 2. A hint of decorative filing on the hammer spring and hammer stop. Arbors not tapered and wheels held by a separate brass collet. Daniel Barrow was apprenticed in 1719 for the relatively high fee of £25 to John Seddon of Frodsham, and both of them were also Quakers. The high fee is a mark of John Seddon's standing as a clockmaker. Barrow was a witness in 1725 to the marriage of William Whittaker and Esther Littlemore, as too was John Seddon. Not much is known of Barrow, who is believed to have died relatively young between 1729 and 1731. I know of no clocks by him. John Seddon was better known, probably the first in clockmaking terms of a dynasty of several generations. He was the son of Daniel Seddon, who had married in 1675 to Katherine Williamson of Crewood Hall, sister of Hannah Williamson, who had married Joseph Littlemore in 1687. So John Seddon was Jacob Littlemore's cousin. Not much is known about this first John Seddon after 1719 except that a sundial by him is recorded dated 1723, and of course his witnessing of the wedding in 1725. A second John Seddon worked there later, between about 1754 and 1795, and a few clocks are known by him, to which he gave serial numbers (e.g. 145, 208). No lantern clocks are known by any of the local clockmaking Seddons, nor in fact by anybody else from this locality. As to this lantern clock itself this has one feature akin to those few other clocks known in north-west England, Lancashire in particular, in the integral pillar, cast in one with the finials and feet attached. The principle is like that of some Lancashire examples though the style of the finials and feet themselves are much more related to post-Restoration London. The engraving style is very individualistic. The idea of flowers springing from a vase in the dial centre was becoming popular by this time, particularly in the West Country. But the engraving itself is very detailed and done in an unusual style. So too are the spiky-leaved dial corners. The dolphin frets are engraved in a distinctive and unusual manner. This was an engraver thinking for himself and it reminds me of the work of nobody else in this area. The original iron hand too is unusual in style. Mechanically the clock is more conventional, with original anchor escapement and parallel arbors. The clock probably dates from the 1690s. It is of regular size standing just under sixteen inches. The implication is that Joseph Littlemore made the clock himself, perhaps having brass castings purposely made. If he had merely bought the parts to finish, assemble and retail, they would probably have resembled other clocks from the region. To me the clock looks individual in style. One day another lantern clock may come to light, but for the present this is the only known clock by Joseph and the only known lantern clock made in Frodsham.